Do you have dreams of jumping into a trailer and heading west? Are you enamored with days gone by? 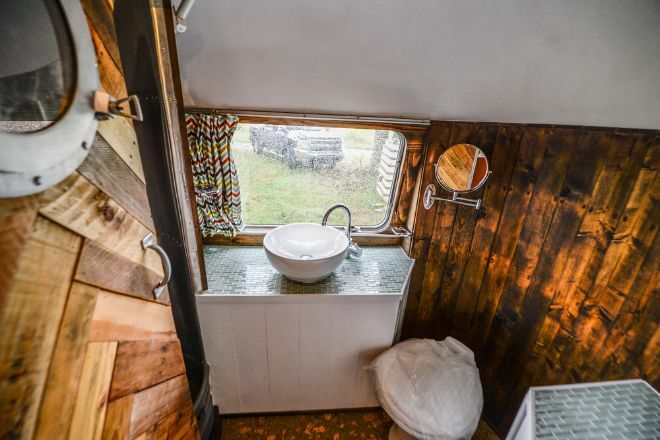 Or do you simply love to camp but wish it included a real bed and a full kitchen and shower? Wind River Tiny Homes have got your back. Wind River Tiny Homes creates customized dwellings that can be towed and traveled in full time or used as a permanent abode. 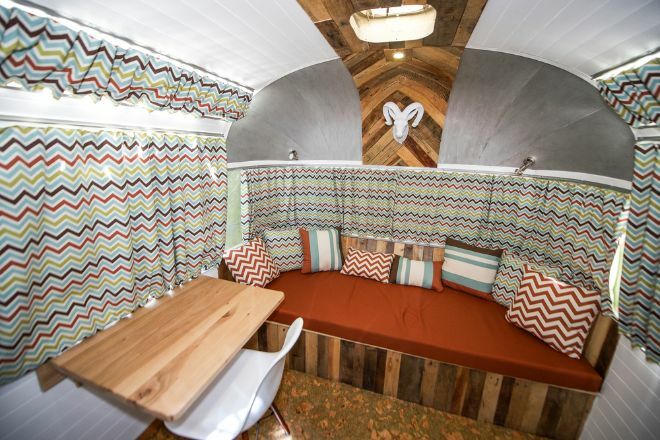 The company has evolved in response to the growing tiny house movement. This movement requires embracing a minimal lifestyle. Most Tiny home enthusiasts are also travel-loving wanderers who thrive living a nomadic lifestyle. 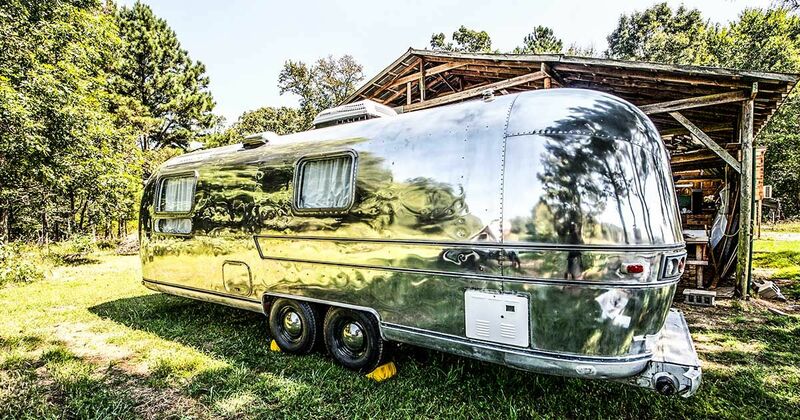 The most recognizable of these towable tiny houses is the Airstream. 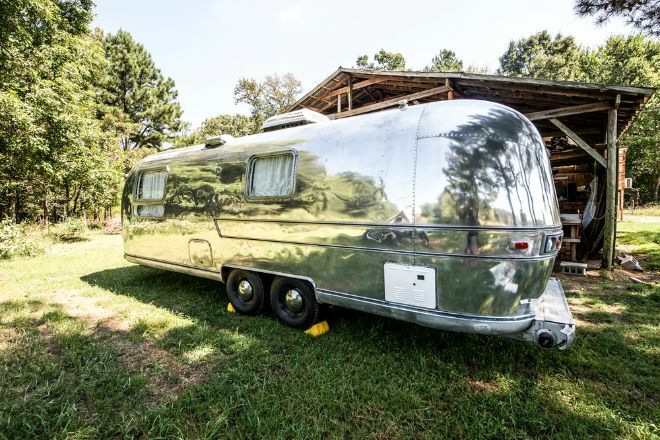 Airstreams are sturdy, well built, long lasting trailers that can be easily remodeled into a comfy home. 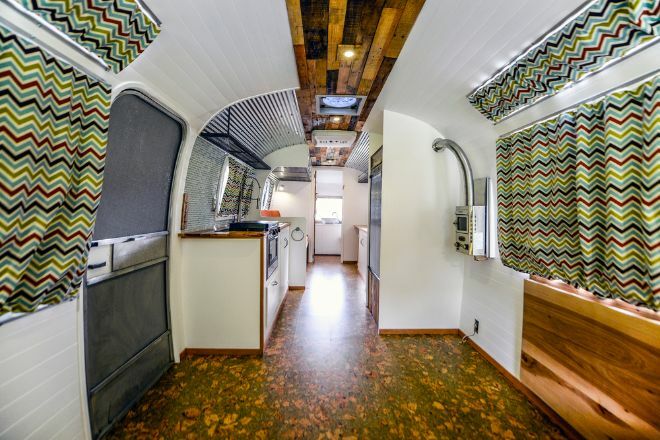 The Tiny Home Community’s affection for the Airstream was the driving force behind the restoration of this Airstream by Wind River Tiny Homes. This carefully restored classic will blow you away with its amazingly simple but well-thought-out design. 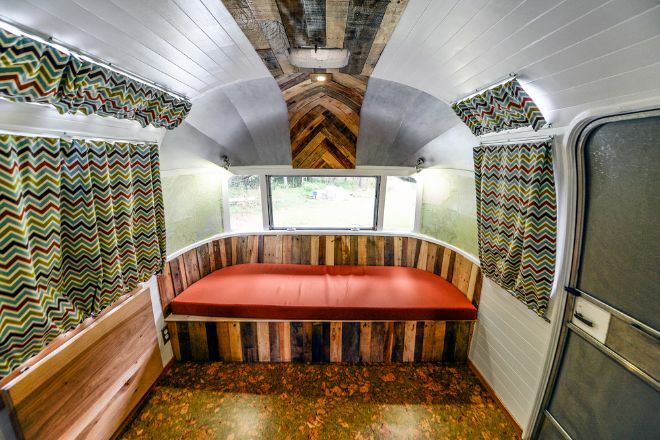 The Airstream was lovingly and carefully restored. The outer aluminum shell was polished to a mirror shine and looks like it just rolled off the assembly line. The interior of the trailer, while not as traditional, is just as impressive. The design aesthetic is all about rich earth tones and funky prints. The zigzag pattern on the curtains is perhaps the most noticeable detail. The floor is made from linoleum and lots of wood paneling covers the counters, ceilings and wall. 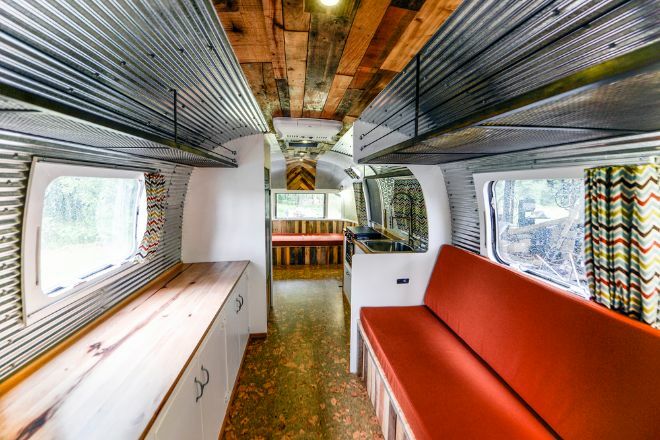 The Airstream's aluminum ceiling is painted white and creates great contrast against the brown. On the right side of the trailer is a couch with orange cushions. Highlighted with wood, the couch is also a queen-sized bed. On the wall under the window is a collapsible wooden flap that can be used as a desk and folded back down when not in use. The dome shape of the trailer creates an airy feeling. 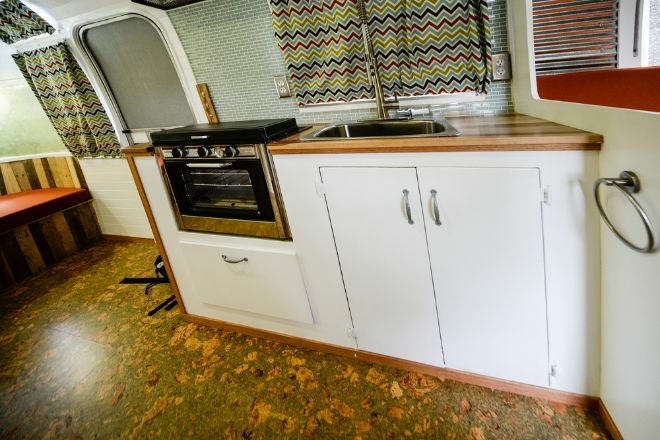 The monotony of what would otherwise have been a plain white ceiling has been livened up by a long wooden stripe that runs the length of the trailer. The kitchenette in the Airstream has a stainless steel under-mount sink with chrome faucet. The kitchen has an oven and table top burners as well as a fridge with aluminum door. There is adequate storage space in the white drawers. Plenty of counter space and storage is available in the form of a long counter flush on one side of the trailer. This countertop is made from wood and features lots of cabinets painted white. On the other side of the counter is a long couch with orange cushions. This couch has lots of storage underneath and above it. 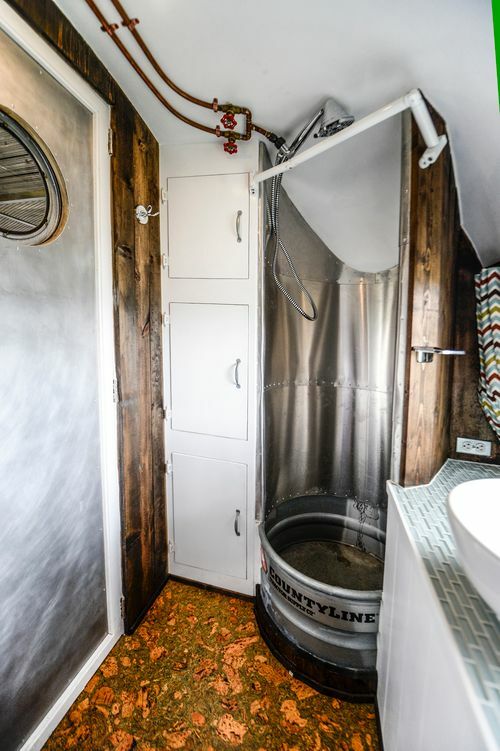 The most awesome detail in the Airstream is the bathroom area. A 24-inch round trough is sunk in the shower area and has a custom aluminum sheet for a cover. The bathroom sink is a round porcelain bowl mounted on the counter with chrome faucet. The bathroom area has a linoleum floor and the walls feature the same wood paneling that highlights the couch. The wood paneled walls contrast well against the pristine white of the porcelain and the bluish grey tile on the counter. We love this restoration and think it's the perfect place to spend your vacation or try out for a tiny home. What's your favorite detail? Let us know in the comments and SHARE this with your loved ones!